This shop has been compensated by Collective Bias, Inc. and its advertiser. All opinions are mine alone. #PickedAtPeak #CollectiveBias It’s time for a one pot sausage rotini bake. Anyone who reads my blog knows that I am a big fan of easy weeknight meals, particularly those that can considered one pot meals. But don’t let the word easy make you think that It means that my recipes lack flavor. They are anything but! 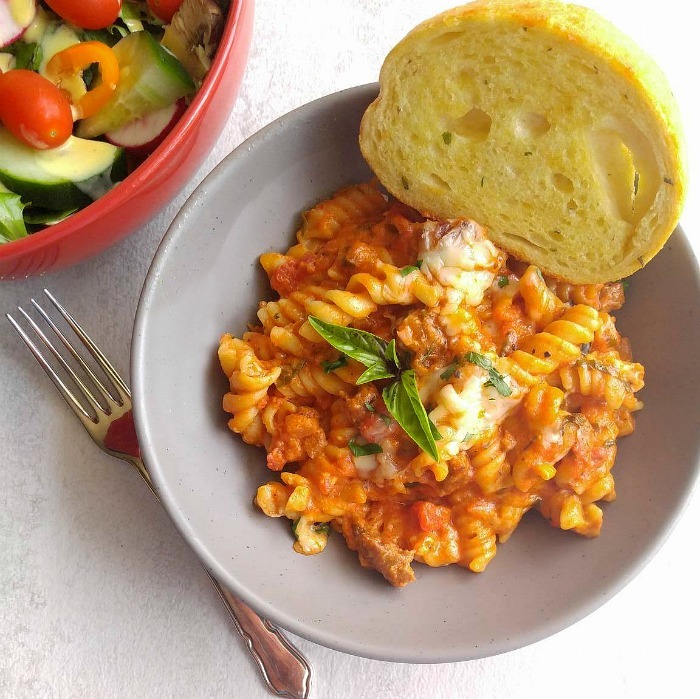 This one pot sausage rotini bake is super easy to prepare and clean up is a breeze, since everything comes together in one pot. And the taste? TO DIE FOR!! I’ve been cooking a lot of one pot meals lately. I love the way the flavors develop from this style of cooking. Check out my one pot jambalaya recipes for a full bodied dish. 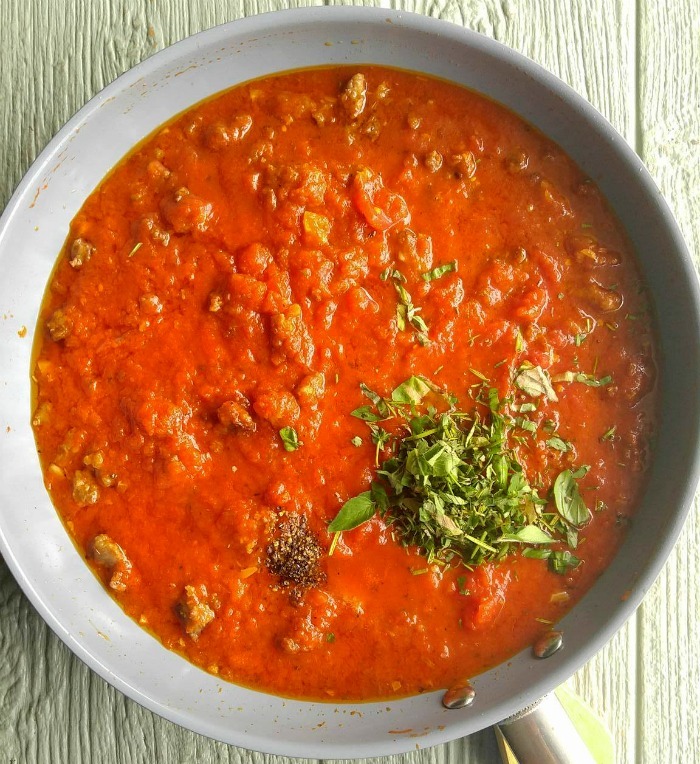 Be sure to check out my tips for one pot cooking to make sure your recipes are a success. I am also a big fan of shopping at the Farmer’s market, but my local one is a bit of a drive for me so I don’t get there as often as I would like. Imagine my delight when I was shopping at my local Walmart the other day and discovered a new pasta sauce called Prego® Farmers’ Market pasta sauce. The sauces come in several varieties, and I picked up both the Classic Marinara and the Tomato and Basil varieties. 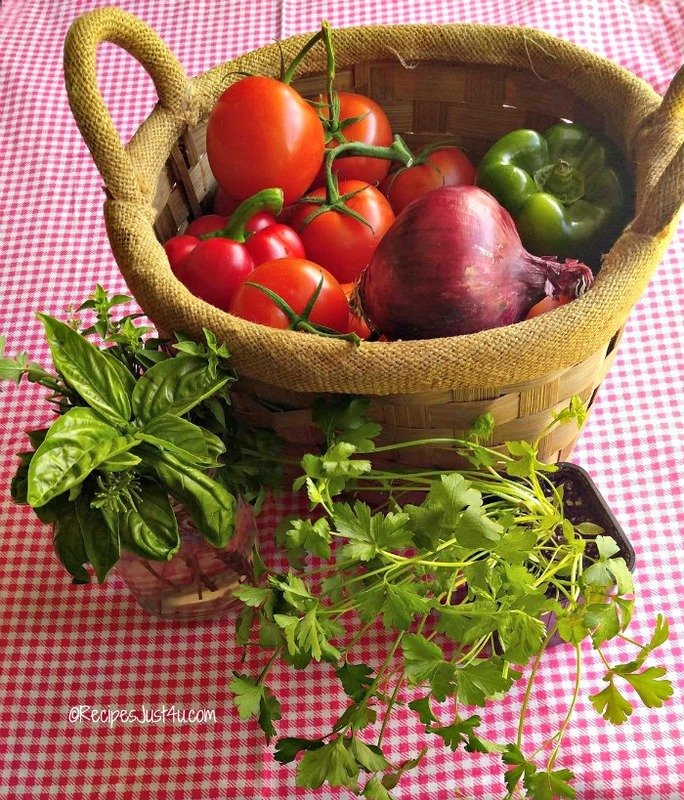 When I think of the Farmer’s market, I picture vine ripened tomatoes picked at the peak of freshness, along with fresh herbs, and garlic and amazing flavors that only come from farm fresh ingredients. In a word or two? Irresistible taste!! As soon as I saw this new pasta sauce, my recipe started coming together in my head. Since I have a bit of a farmer’s market thing going on in my back yard with tons of fresh herbs, I knew that rosemary, MORE basil, fresh oregano and thyme were going to make it into my one pot meal. This one pot sausage rotini bake is the perfect weeknight meal that is easy to make and super simple to clean up after. I chose a Rotini pasta for this recipe. I want to make sure that every bit of this drool-worthy sauce makes its way onto the pasta, and rotini pasta does this in spades! For my protein, I am choosing mild Italian sausages, with the casings removed. My cheeses are Parmesan Reggiano and extra sharp cheddar cheese, just because I happen to love them both! 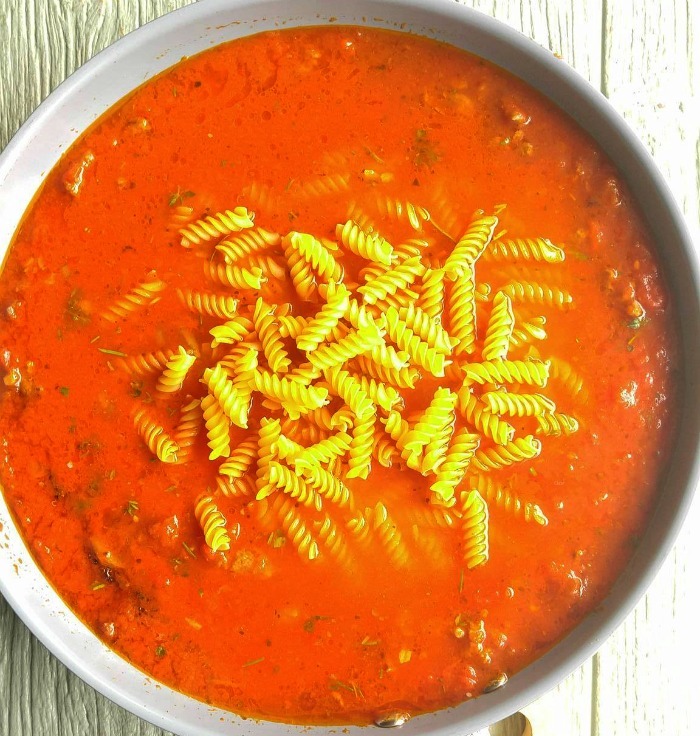 Since I will be cooking the pasta in the same pot as the sauce, I will also use some extra tomatoes so I don’t have to add too much extra liquid that would dilute the flavor of my sauce. 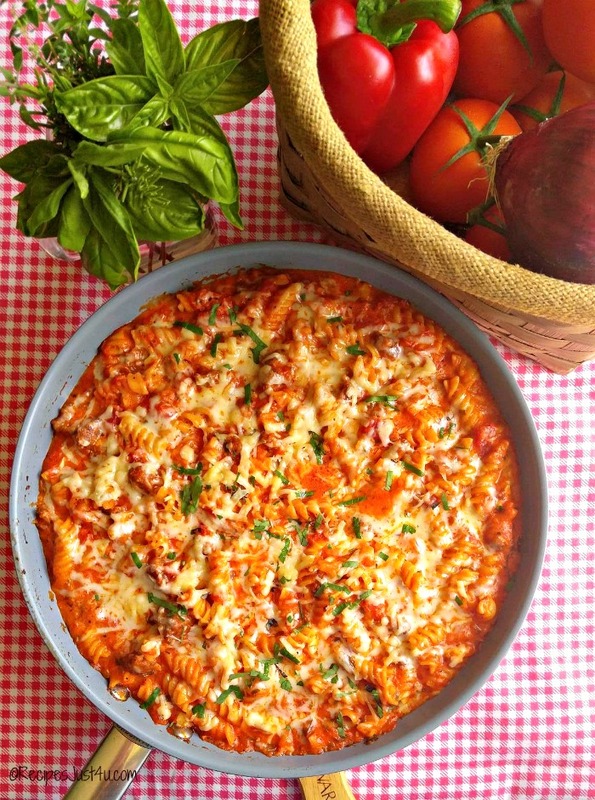 I just love the way this one pot sausage rotini bake comes together. With each delicious addition of ingredients, the flavor of the dish changes, from spicy to savory to creamy….to YUM! The dish is made in four stages. 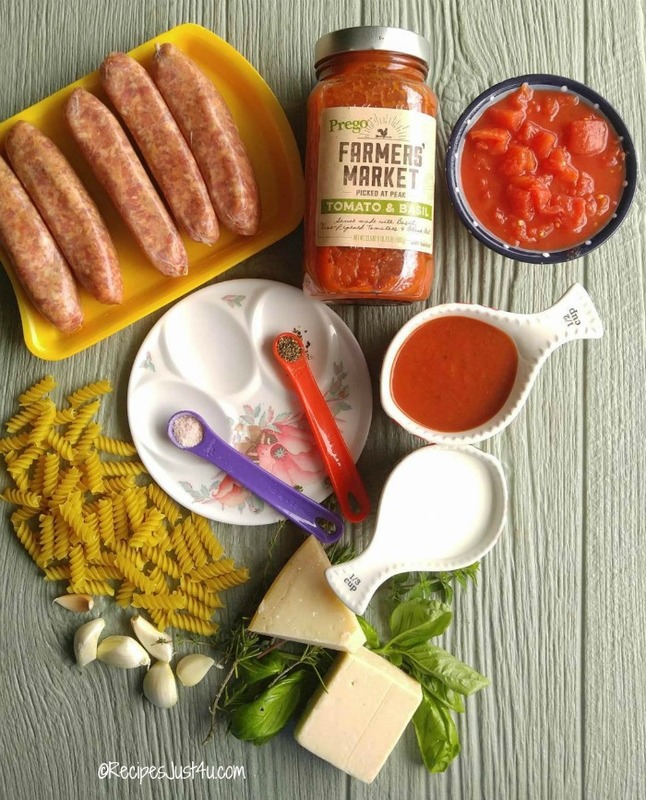 Start by browning your mild Italian sausages, then add in the garlic, and your Prego® Farmers’ Market tomato & Basil sauce and the diced tomatoes and tomato sauce. Next comes all those fresh herbs to enhance the already fabulous flavor. Since this is a Tomato and Basil sauce, I decided to add plenty of fresh basil to the pot. The next step is to add your water and rotini pasta and cook this until the pasta is al dente. Finally, on goes the heavy cream and Parmesan cheese, a sprinkle of the sharp cheddar cheese over the top, and then pop the whole thing into the oven for a few minutes until the cheeses melt and are bubbly and delicious. This fabulous pasta is so full of fresh farmer’s market flavor. It has a hint of spice from the mild Italian sausages, with a comfort food richness from the cream and cheese. This casserole is one of the best ones I have ever made and I love how easy it is to make. After making this dish, you will never used boxed convenience pasta products again! 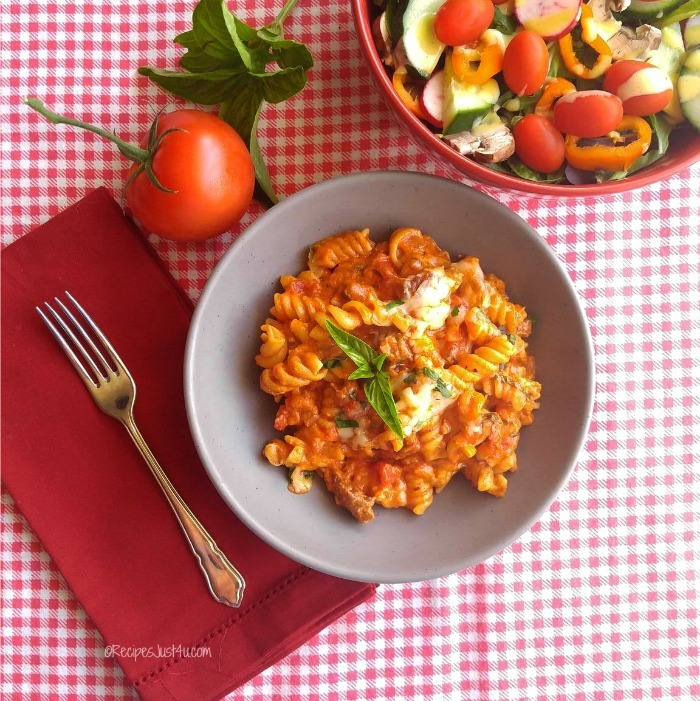 Add a red gingham table cloth, some some garlic toast and a tossed salad and your Farmer’s market one pot sausage rotini bake dinner will be a huge hit. This will be one that they ask you to make again and again, and you won’t say no because you know it will be on the table in less than 30 minutes. 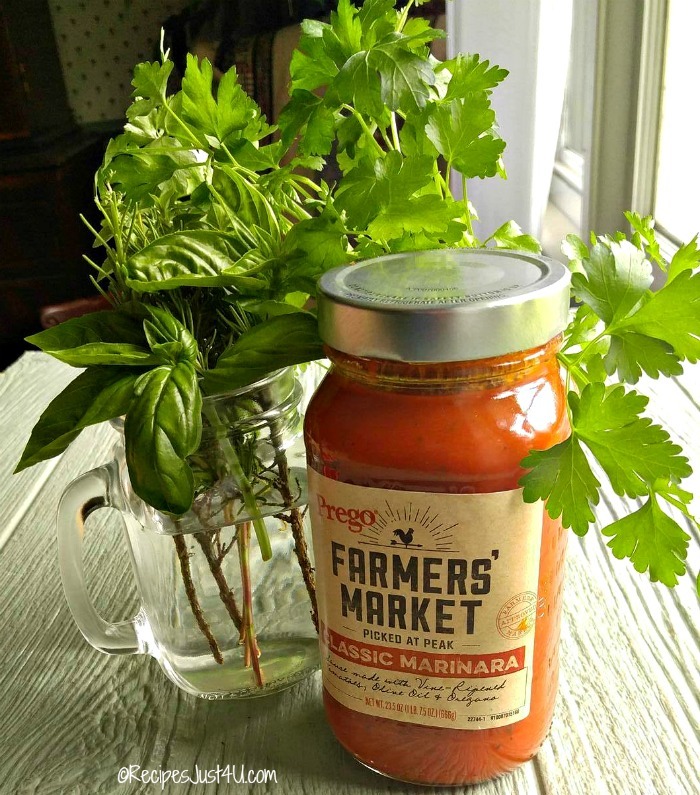 I can’t wait to use the Prego® Classic Marinara in my next Italian style recipe. Ready to make this for your family? 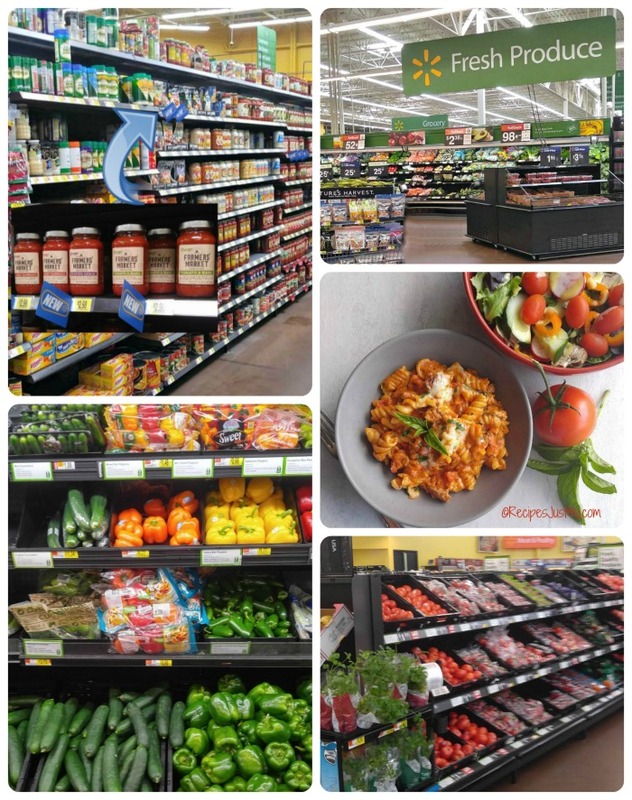 Just head to your local Walmart and pick up their new Prego® Farmers’ Market Tomato & Basil Sauce, then visit the produce and deli aisle to scoop up your fresh herb and cheeses. In a few quick steps, you will be sharing a farm fresh recipe with a “fresh picked” flavor that you won’t believe! 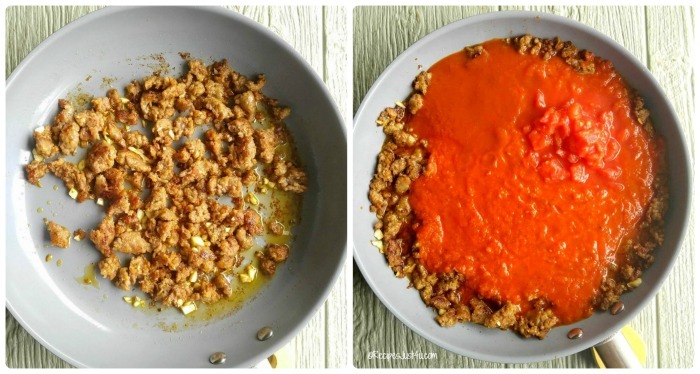 What dinner recipe have you made that uses just one pan? Tell us about it in the comments below! In a large oven-safe skillet, add olive oil over medium heat. Remove the skins from the sausages and cook until the meat has browned, about 3-5 minutes. Add the minced garlic to the pan and cook for 1-2 minutes. Stir in the diced tomatoes, Prego® Farmers' Market Tomato & Basil Pasta Sauce, and tomato sauce. Add the fresh herbs and seasonings, and stir well. Reduce the heat and turn the heat to low. Simmer, stirring occasionally, for 5-10 minutes. Stir in the heavy cream, and Parmesan Reggiano cheese. Sprinkle the sharp cheddar cheese evenly on top. Place the skillet in the preheated oven and bake until the cheese has melted and browned, about 5 minutes. Serve with some hot garlic bread and a tossed salad. Enjoy! By far one of the best recipes I found on Pinterest so far! So rich and creamy, got it simmering as I am writing this, second time I am making this in the last week! Big hit at my house with hoth the husband and kids!